Reading the temperature just became more colorful. Attractive LCD display shows real-time temperature updates (°F/°C) indoors and out, current time (12/24 hour), date or weekday (English, Spanish, or French), and temperature trend indicators. 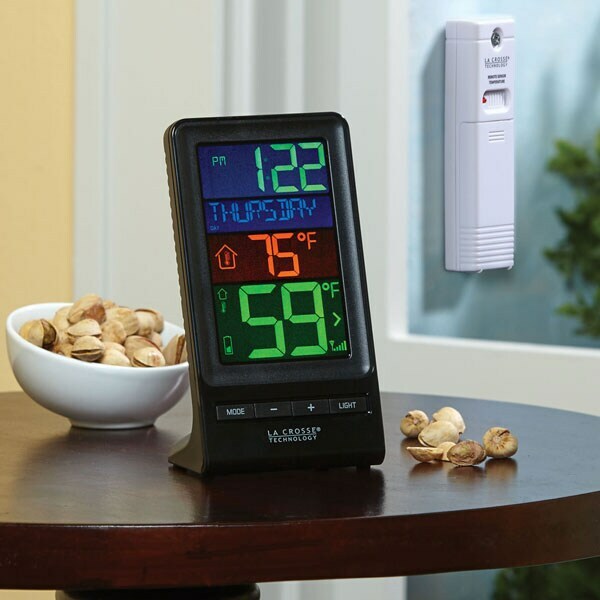 It keeps daily high and low indoor and outdoor temp records and lets you know when the batteries need replacing. Simply mount the wireless sensor in a shaded area outside your home; transmission range up to 300 feet. Requires AC adapter (included), 2 AA batteries for backup (not included). About 3 ½"w x 6"h x 2"d on built-in stand.